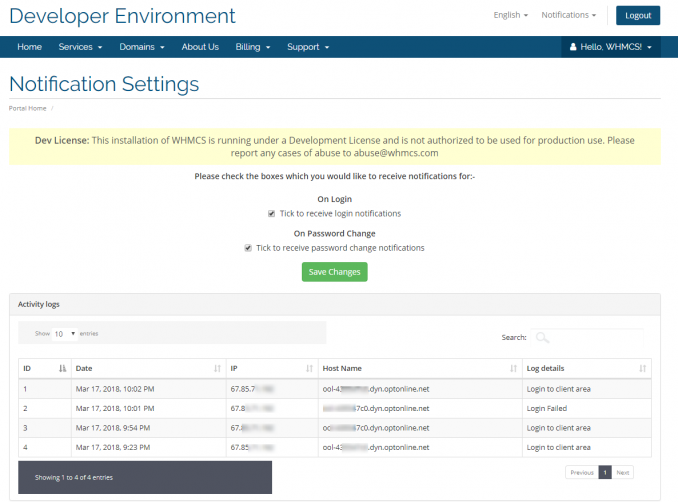 With this module, your clients will get an email when they login, failed login to the accounts or change the password. Each time the client's login they will receive an email with login details or when someone login with the email. From module settings, you can uncheck/check if you the admin like receive the notification emails and client want to receive the client notify also have the ability to check/uncheck his own notification Setting from the client area. When you buy the Source Code you get a FREE Peel Away Ads. Excellent addon our customers can now know any activity in your account. We are happy with this module, so far. It secured the environment a lot and improved our quality of clients area. I give 5 Star to it. Super module easy way to get the information asap to the client. The service is always A ++ immediately answer even chat session was available. We will order again absolute perfect. WHMCS Services absolutely trustworthy we have 10 modules. 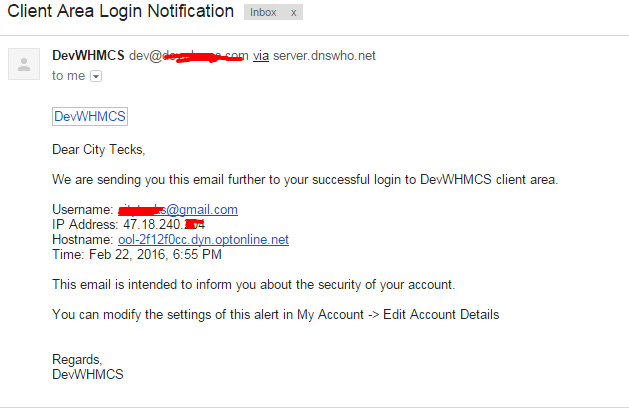 amazing how well it worked for us, addon that I point out to everyone who owns whmcs. Congratulations to the developers and support whmcsservices. Looking forward to seeing more and already have this updated and informing our customers about anything. Awesome Module to Notify your Users so if Anyone uses your Client Area you can notify Asap & take Action. This is Awesome Module my WS. just an awesome module to enhance the security. This module is very good for protect my client's account. Their support help me to install the plugin. Nice feature to add to a website and account security. Works great, had no issues setting it up. Thanks for the feedback Dean Richards, I really appreciate it!